I suppose this is something of a two part question. Let me start by saying I am very familiar with airports, so I am aware of the general time to de-plane, go get your luggage, leave the terminal, etc. However, I have never been to LAX, nor have I ever rented a car. Now to my question. In June my family is planning a vacation to California. We will be flying in/out of LAX, and our vacation rental is in Santa Barbara. My family will be flying out of O'hare, and will not arrive until around 930 Saturday night. I live a few hours away from the rest of my family so I will be flying separately. I am thinking of getting an earlier flight (landing around noon or 3 pm on Saturday). I was hoping I could take care of renting the car, go to Santa Barbara to check on the rental place and get the keys, and do a little solo sight seeing before I head back to LAX to pick up the family at 10 PM. So my first question - Is this a reasonable time table? Google maps has the drive from LAX to Santa Barbara at 1 3/4 hours. That is obviously very doable if I arrive at noon and need to be to LAX at 10. However, I have always heard how bad traffic by LAX is so I am not sure what potential time that could add in. Which makes my second question - Is Google Maps travel time still reliable in regards to LAX traffic? This is entirely doable, given that it's a weekend. LAX to SB is about 2 hours with moderate traffic. In LAX all car rental places are off the airport so you have to take a shuttle and it could be up to an hour or so from landing until you sit in the car. Make sure you have a nav system available (your phone is fine): the car rental lots are in an odd locations and signage to the highway is pretty bad. If you head up straight 101, you should be in SB by 6pm at the latest. If you have time to kill, I highly recommend driving up the Pacific Coast Highway through Malibu instead. It's about the same distance and half an hour more of driving time: But it's one of the most scenic drives in the US (in my personal opinion). Plenty of opportunities for quick stops on beaches or cliffs. To get back to LAX, I'd leave SB at 7.30pm or so. That's plenty of margin to park the car and get the arrival gate. You can check traffic life, and if it's good, wait until 8pm. CAVEAT: traffic is generally low to moderate at these times, but this is LA and traffic chaos is always a possibility. 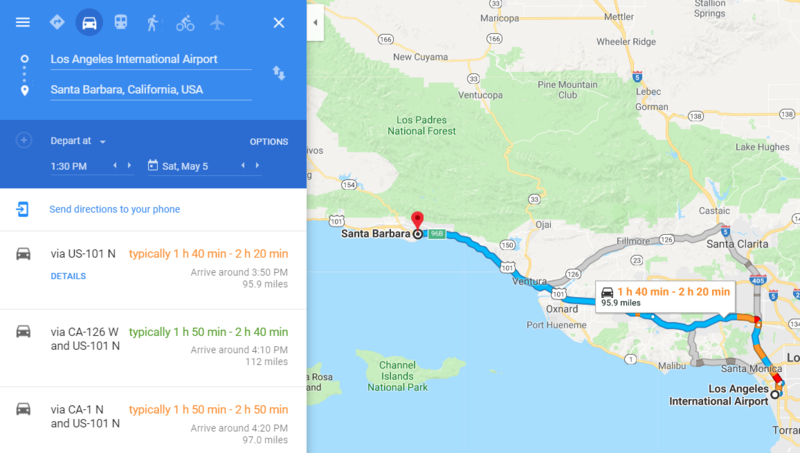 While it's unlikely that you will hit heave traffic, it's not impossible: once coming from LAX I spent an hour just for the 10 miles from Carpinteria to Santa Barbara and that was around midnight! As @Newton says, you can use Google's leave/arrive options to estimate the range of times. Time to get out of LAX in your rental car is more variable depending on rental car company than at airports that have shared shuttles to a single rental car location. Google maps thinks it's going to be a bit less traffic on the way back to LAX (less than 1h50 min via the 101 Hollywood freeway, so they say to leave SB by 8:10pm). If you check again close to your actual departure time, the routes and times will take into account the inevitable accidents, closures, construction etc. I imagine there's also a non-zero chance the family's flight out of O'Hare won't be on time. I use tracking sites like flightaware.com to avoid having to wait around more than necessary when picking up people at the airport. Well....it's possible, but IMO, not worth it. Meaning, if all you want/need to do is get the key and that's worth driving 300+ miles. Go for it. If getting the key ahead of time is not critical, there are more viable options to explore closer to LAX. Not the answer you're looking for? Browse other questions tagged airport-transfer california lax traffic southern-california or ask your own question. Is there fast/cheap/comfortable public transport from LAX to Irvine/South Orange County? Can I use Google Maps traffic information to estimate driving time for a specific date/time? Fastest road from Berlin to Düsseldorf? What's the most reliable way to travel between Phoenix MarketCity and Mumbai Airport? Traveling from Ohio to New York's JFK airport to catch an evening, same-day flight? Why did 511paconnect lie to us?